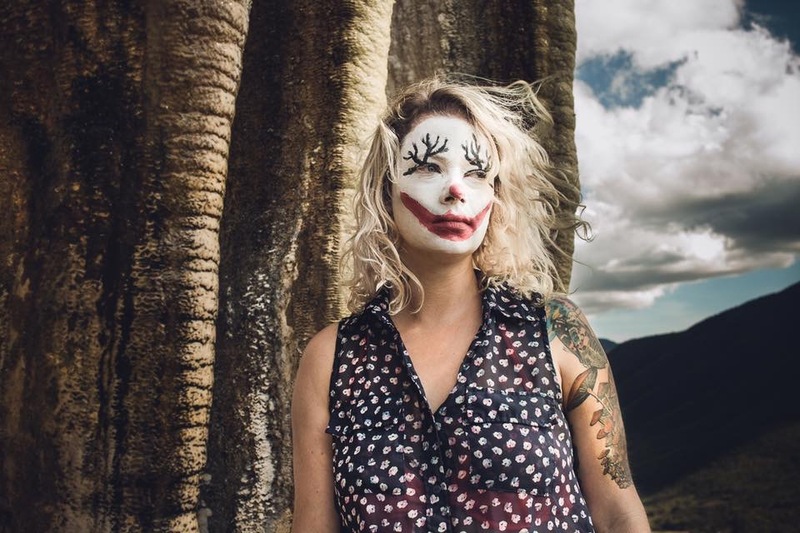 Clowning Around At Hierve el Agua – Where is Lydia? When I arrived to Oaxaca I had chosen to stay in a co-ed dorm in my hostel. I thought why not? More opportunity to make friends. At first the room was completely occupied but slowly as the week went on people began to trickle out and no one was coming to replace them. There was an older man in his 70s, who was a chain smoker with a terrible cough and had been in my room the entire time I had been there. He didn’t look like he was going anywhere anytime soon. At breakfast one morning I asked the two remaining guys in my room when they were leaving, they said today, so after that it would be down to me and the old guy in the room. I decided I had better move into an all female dorm. That morning a new woman arrived at the hostel and was staying in my new dorm room. Asta is from Norway and backpacking Mexico solo as well. She will eventually fly to Colombia where she will spend three months. Asta LOVES Colombia, she thinks it’s the greatest place on Earth. She was compelling me to skip Central America and just fly straight there after Mexico. My recommendation for visiting Hierve el Agua is to go yourself taking taxi collectivos instead of a tour. You will not only save money but you will also be able to take your time to explore the area and swim. I would allow at least 7 to 8 hours for visiting the falls including travel time. We first took a taxi collectivo to Mitla which you catch by the baseball stadium in Oaxaca. When you arrive in Mitla you then need to take another taxi up to the falls. The taxis are usually trucks in which you sit in the truck bed in the back. Asta and I met a couple from Belgium and shared a taxi with them up into the mountains. Usually with Mexican national parks or ruins you have to pay two entrance fees which makes absolutely no sense but hey, it’s Mexico. Hierve el Agua was no exception, we had to pay a “road fee” to drive on the road to get there as well as an entrance fee. I believe the road fee was $20 MXN each (about $1 USD) and $60 MXN (about $3 USD) for entrance to the falls. When we arrived we were standing at the top of the falls and would need to hike down to see the actual petrified waterfall. At the entrance to the park there are several different places to eat as well as purchase snacks and water. You don’t need to worry about bringing anything with you. At the top of the falls there was a large pool of water in which you could swim. Asta wanted to do a photo shoot there but at the moment there were too many people. We decided we’d go on the hike to see the petrified waterfall and come back later to do the shoot. When Asta asked me to be her model it hadn’t really occurred to me that I’d be wearing the clown make up in front of other people. As she put on the make up people stared as they walked by but then quickly went back to what they were doing. It was surprising to me that only two people ever questioned why I was wearing the make up. The trail to the base of the waterfall was very confusing, it was poorly marked and poorly made – we got lost multiple times. I’d never done any modeling before, it was definitely less than glamorous than I had imagined it to be. Between the hot sun and the clown makeup I wasn’t going to quit my day job anytime soon to become a famous clown model. Asta took some photos of me at a second pool as well as at the base of the falls. We then headed back up the trail in the hot sun. The trail led us back to the park entrance and all the different food stands. Both of us were completely starving and drenched in sweat, so we decided to stop for, my personal favorite, a Tlayuda! We also got fresh pineapple juice served in a pineapple! My clown makeup was oil based so none of it had melted off from my sweat or the hot sun. We sat down at a table for lunch, me in my clown makeup looking like an Insane Clown Posse fan, eating a Tlayuda and drinking pineapple juice from a pineapple. After taking some photos at the top of the falls the sun began to set and it was time to head home. We rode in the back of a truck with our Belgium friends as well as four guys from Germany. The Germans never asked about the clown makeup. When we reached Milta we boarded a bus back to Oaxaca. And still, no one ever asked us why our faces were painted! We arrived back at the hostel completely starving and ready for dinner. My Cuban friend Alejandro had given me a can of Guava marmalade while I was in Cuba. He kept bugging me about if I had eaten it yet. It was weighing down my backpack so I told Helena, my friend from Austria and Asta we had better eat it that evening. While Asta and I were clowning around at Hierve el Agua, Helena had purchased three types of cheese and Tlayuda tortillas. I had green beans and broccoli as well which we grilled up. We made some pretty interesting Tlayudas which were surprisingly delicious with cheese, vegetables and guava marmalade drizzled on top. It was inspiring to watch the scene in which the main character played by Julia Roberts has to buy new pants because she’s eaten so much food in Italy. I could completely relate, Mexico is a culture that revolves around food, and there is cheap, delicious street food on every corner. My new diet of corn, meat and cheese was definitely making me gain weight. As funny as it sounds my life motto has always been YOLO, you only have this one life and this present moment, so why not make the most of it? I was not planning on dieting in Mexico, I was planning on embracing the culture, trying new types of food and buying a new pair of shorts.